Back in 2011 High Roller issued a wide-ranging compilation of Sparta’s material under the title ‘Use Your Weapons Well’, the success of which led to the original line-up of guitarist Tony Foster, bassist Tony Warren and the Reders, Snake (guitar/vocals), Karl (lead vocals) and Paul (drums) to have a stab at some new material. First up was the track ‘Welcome To Hell’, and after a thumbs-up from the guys at High Roller the rest of the material swiftly followed. With song titles such as ‘Rock And Roll Rebel’, ‘Death To Disco’, ‘Angel Of Death’ and the title track itself it would be easy to dismiss Sparta as a bunch of reformed NWOBHM hopefuls living in the past, but, trust me on this, would you be wrong if you still had that impression 48 minutes after pressing ‘play’. 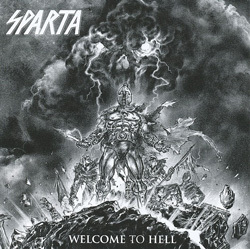 ‘Welcome To Hell’ is about as exciting as it gets, a huge slab of raging metal with as much muscle and might as the massed ranks at Thermopylae. The album features nine wholly new songs as well as a re-recording of an old favourite, and shows that, despite the adage, an old dog can certainly learn new tricks. In the same way as Soldier’s ‘Dogs Of War’ proved last year that the old guard still had a lot to say Sparta have come up with an album with its roots in the past but its face to the future. There’s some really quite exciting material on this album and if there’s a weak link it’s probably ‘Angel Of Death 2013’: a re-recording of the band’s second 7” A-side from 1981 it forms a nice bridge between old and new, although as good as it was back in the day set against the rest of the album it does stand out like a pensioner in a crowd of cocky young upstarts. I’ll concede that Sparta can be highly derivative in places (the bouncy ‘Dreaming Of Evil’ is pretty much Cameo’s ‘Word Up’ as popularised by Gun, for example, and ‘Arrow’ is so Motörhead it should be spelled with umlauts), but let’s not let that spoil the party. Highlights come thick and fast, and although ‘Wild Night’ with its extended slide solo takes a lot of beating, it’s the riff-driven ‘Time’ and the epic (in feel and stature) ‘Kingdom Of the Sky’ that do it for me over-and-over again. Sparta also proved to be a tremendous live act at BroFest in February, so both on stage and on record the future’s looking bright for the Nottinghamshire band. It’s said that only Spartans who died in battle (and Spartan women who died in childbirth) were entitled to having their names engraved on their gravestones. On the strength of ‘Welcome To Hell’ these guys have earned that right too.